Not only in the Sambodromo is the Carnival in Brazil. During next days you have the possibility to take part in the famous "blocos de rua", groups of people playing drums, singing and celebrating the most important period of the year in this country. Every day a different option. 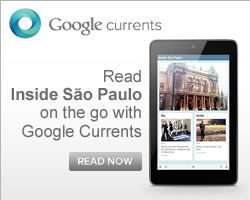 Inside Sao Paulo will keep you informed so that you won't miss anything. Time: meeting from 4 pm, the parade begins at 9 pm. T-shirt: R$ 10, plus three cans of beer or soda. $10 for a t-shirt and three cans of beer!?! That's the best deal I've seen since getting to Sao Paulo! Hi Russ, did you finally go to some "bloco de rua"?